In the Main Menu, click Reports, Standard. Standard reports allow you to track and view data using standard, text-based reports. They include production and income reports, daily and monthly reports, lists, and public health options. Display Settings: Customize which reports list on the window. Security Permissions: Restrict access to reports by user group. Report Server: Set up a report server to run Production and Income Reports. This can be useful for large offices to prevent lockups and slowness in a live database. Misc Settings: Set report defaults. User Query: Open the Query window to run custom reports. See User Query. Laser Labels: This feature was added entirely by Kapricorn Systems, Inc. See Laser Labels. More Options: Open the Production and Income Report window so you can customize report options. Today: Generate a report for today's date using default settings. Yesterday: Generate a report for yesterday using default settings. This Month: Generate a report the current month (1 - 31) using default settings. Last Month: Generate a report for last month (1 - 31) using default settings. This Year: Generate a report for the current year (Jan 1 - Dec 31) using default settings. Monthly: Common monthly reports that are usually part of billing. 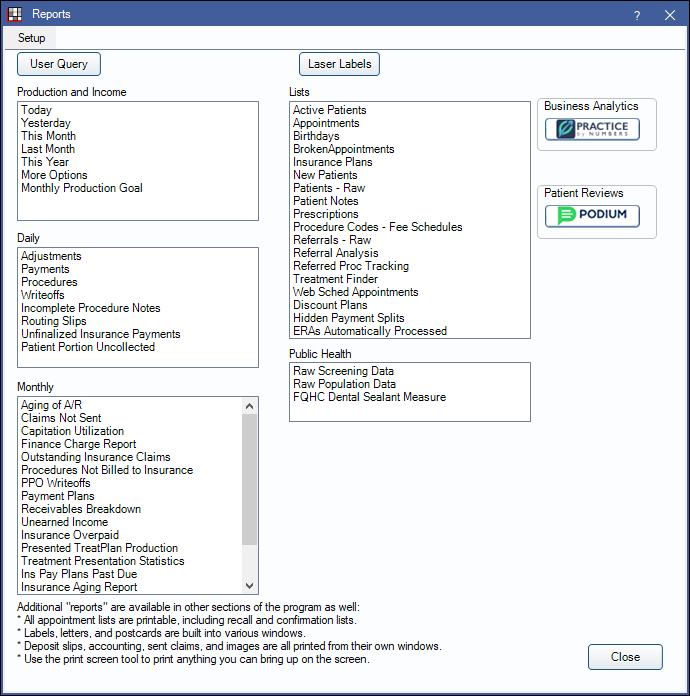 Lists: Common reports that pulls lists of various patient data. Public Health Reports: Public Health reports. Business analytics: Preferred business analytics service providers. Click a button to see more info; you won't be charged. If the bridge is already enabled, click a button to launch your account. To remove the button(s), go to Program Links, double click the bridge, uncheck the Enable box, then check Hide Unused Button. Patient Reviews: Podium is a preferred patient review service provider. Click the button to see more info; you won't be charged. If the Podium Bridge is already enabled, click to launch your account in Dental Intel. Locked shows next to the report and when I attempt to generate it, I receive a message that I do not have permission to run it. You do not have access to locked reports. Access is controlled by user group in Report Setup.